Sarah Hart was pregnant with her second child when her husband, bricklayer Edward Hart, stole food to feed his hungry family. On the run for 17 months, when captured he served six years on board prison hulks. After his release the family searched for a better life and found it offered by the New Zealand Company, arriving in 1841, the year after the Treaty of Waitangi was signed. Eliza was their first New Zealander, born in 1846. A mother of 12, she became a suffragist and actively sought the vote for women, which was granted after a `monster petition' was presented to Parliament in 1893. 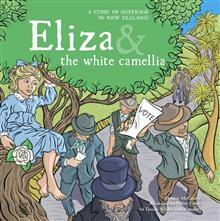 This bilingual children's picture book is a Suffrage 125 project and spans Eliza's life, from poverty, emigration, elections, illegitimate children, women and the vote, the trial of Minnie Dean and the formation of the National Council of Women, concluding the month following the start of World War I. Lavishly illustrated with a mix of original artwork, photographs and ephemera, the book also includes the following: Contents Page, Fact Boxes, New Zealand Timeline, World Suffrage Timeline, Suffrage Activities, Suffrage Quiz, Glossary and an Index. Award-winning author Debbie McCauley is also a librarian, historian and owner of Mauao Publishing, a Tauranga based indie business passionate about connecting Aotearoa's tamariki with beautifully produced books telling stories from our own backyard. This book on her fourth great aunt is a Suffrage 125 project marking 125 years since New Zealand women gained the right to vote.